It is the nature of the news media to look for shiny objects. This principle means any car wreck, road rage shooting, or semi-truck turnover on the freeway is a slam dunk for the first news item at 6 PM. The news media is not predisposed to look for solutions, and, indeed, has, to a degree, a legitimate claim to the point that this isn’t its job. It’s when the news media highlights problem for which there are known solutions that it misses the opportunity to truly inform its readers. This is the case this week as the New York Times covers Japan’s efforts to deal with a growing inventory of plutonium embedded in its spent fuel inventory by recycling it into Mixed Oxide Fuel (MOX). The NYT story is accurate as these things go, but it is also one-sided in that it mostly addresses areas where Japan has fallen short, so far, in its MOX fuel strategy. The experts quoted are drawn from the field of nonproliferation of nuclear weapons. The article would have been much more complete in its coverage if it had also talked with people who are expert in the reprocessing of spent nuclear fuel and manufacturing of MOX. A total of 47 or so tonnes of plutonium have accumulated by Japan so far raising fears among other southeast Asia nations about what Japan might do with it. Most of it is embedded in spent nuclear fuel from light water reactors which makes it very expensive and dangerous to reprocess to extract the PU-239 for use in nuclear weapons. Yet , one might think that the New York Times was right to cast this story as one with a heavy nonproliferation tilt. To this end the newspaper quotes several nonproliferation experts who offer various credible perspectives on the problem. Note that of the total inventory, only 10 tonnes are actually in Japan. The rest is split between the U.K. and France. This means that a fast path to making bombs is out of the question and some fears about such a scenario, raised stridently by China, are flat out overblown. Solutions Exist. Why Didn’t the Newspaper Report Them? What’s missing from the story is that Japan has a number of solutions staring it in the face which so far it has failed to execute in a timely manner. Reader of this blog may recall my coverage of the issue earlier this year. Japan’s problem with its recycle strategy to make mixed oxide fuel out of the plutonium in principle makes sense, but as a practical manner is confounded by a failure in its technical execution. The Rokkasho plant is designed to extract 8 tonnes of plutonium a year from spent nuclear fuel and reprocess it into MOX fuel. A back of the envelope calculation indicates that amount could produce about 400 PWR type MOX fuel assemblies a year. Given the rate at which Japan’s restart of its reactor fleet is taking place, from a stocks and flows perspective, it may make a dent in the inventory, but it won’t catch up. The problem, and it is the white elephant in the room, is that the plant has been under construction for over two decades. It initial cost estimate of about $7 billion has ballooned to $27 billion and the completion date is still two-to-three years in the future. The Japan Atomic Industrial Forum (JAIF) says a minimum of 16-18 reactors, or more likely 30 reactors, must be brought back online in Japan to meet the recycling target. So far only nine units have been restarted and only four of them are licensed and capable of burning MOX fuel to reduce Japan’s plutonium inventory. In the list that follows the reactors with an asterisk (*) can burn MOX. The nine units that have been restarted in Japan since the Fukushima accident: Ohi-3, Ohi-4, Genkai-3*, Genkai-4, Sendai-1, Sendai-2, Ikata-3*, Takahama-3* and Takahama-4*. Unlike Russia’s work with its “BN” series of fast reactors, Japan has not committed to a robust R&D program to design and build fast reactors that could burn MOX fuel. In November 2017 after years of technical difficulties, Japan’s government shut down the Monju fast reactor. Its design was innovative which may have been part of the problem. According to the World Nuclear Association, it has three coolant loops, used 198 MOX fuel assemblies surrounded by 172 blanket assemblies, and operated at 714 MWt, 280 MWe gross and 246 MWe net. Alternatives for Japan’s MOX strategy include signing over, for a fee, the plutonium inventory in the U.K. to that nation, which is already a nuclear power. Once the U.K. Nuclear Decommissioning Authority (NDA) has title to the fuel, it has the opportunity to bring fast reactors whichh can burn spent fuel, like the GEH PRISM, into the picture. A second alternative is to speed up the glacial pace of reactor restarts and in parallel modify the licenses for the restarts so the units can burn MOX fuel. A PWR can use MOX in one-third of its core without much adaptation. The MOX fuel a higher energy value and has longer period between fuel outages. A push for faster restarts would require political will and a commitgment by the central government to overcome the exploitation of Fukushima fears by ambitious provincial officials for political gain. TEPCO, which owns and operates the largest nuclear power station at Kashiwazaki-kariwa (7 BWRs) has work to do there in this regard. It would also lower Japan’s reliance on imports of coal and natural gas which has had a significant negative effect on the country’s GDP as well as efforts to reduce greenhouse gas emissions. Insofar as the waste streams from the MOX plant itself is concerned, the liquid waste from the plant can be turned into dry calcine and then stored in steel canisters for eventual disposal in a LLW facility. Yes, it will take time for the calcine to cool off, in terms of radioactive half lives, but with welded shut steel canisters there is no chance of release. At the Idaho Cleanup Project, it is managing radioactive calcine, a granular solid similar in consistency to sand. Calcine was transferred to large stainless steel bins encased in six high-integrity concrete vaults called bin sets. Calcining achieved significant volume reduction from liquid to solid. Lastly, Japan has a contract with EDF/Orano which is could leverage to speed up reprocessing of its spent fuel into MOX to isolated the plutonium in a form of fuel that would make retrieval for use in weapons all the more difficult. La Hague has processed spent fuel for reactors in Europe and Japan. 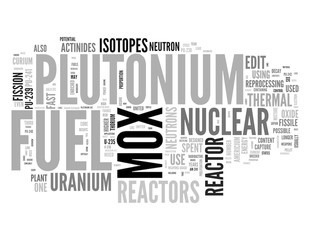 Since 1972, 44 commercial reactors worldwide have been loaded with MOX fuel. At La Hauge, only 4% of nuclear material from used fuel reprocessing is waste, plus the sheared metal pieces (shells and ends). The fission products are heated, then mixed with molten glass and cast in stainless steel containers, a safe and stable packaging for thousands of years. The waste metal pieces are compacted and placed in storage containers. Why Didn’t the Newspaper Talk to Experts on MOX Fuel? There are many experts in the production and use of MOX fuel globally. It’s a disappointment that the New York Times did not seek any of them out for their views on Japan’s challenges or to suggest ways to solve some of the problems the country faces in relying on MOX fuel as a solution. The newspaper’s reporter and editors could have started by talking to the American Nuclear Society (ANS) which has a long standing policy position on the benefits of converting weapons grade plutonium into MOX fuel. Also, in the U.S. the Nuclear Energy Institute (NEI) has gone on record with the Department of Energy and Congress in favor of converting weapons grade plutonium into MOX fuel. It is a no brainer for the newspaper to have called either or both groups to ask for experts to comment on ways Japan could succeed with its MOX fuel plan. And that is what would have been the other half of the story. Maybe the newspaper in a follow-up article will pursue this line of inquiry? Note to readers: I did try to reach the NYT reporter in Tokyo who wrote the story. The newspaper did not reply to my emails. (NucNet) The US Congress has approved an energy and water spending bill for fiscal 2019 that includes $1.33bn in funding for the Department of Energy’s nuclear energy research, development and deployment programs, an increase of $121m over fiscal 2018. The bill includes $323.5m in funding for the DOE’s reactor concepts research and development program, an increase of $86.5m over 2018. This includes important programs such as advanced reactors and light-water reactor sustainability. The bill increases funding for the versatile test reactor program, which would create a sodium-cooled fast reactor to test advanced technology reactor components and materials, from $35m to $65m. In a new development, the bill provides $20 million in funds for the high-assay low-enriched uranium, or Haleu, program, which could be used to fuel advanced reactors. See prior coverage on this blog Navy Nuclear Fuel Recycling Program Approved By Senate, The demonstration project would down blend high-enriched uranium (HEU) fuel to a level where it could be used in advanced nuclear reactors. These reactors require a fuel known as high-assay low enriched uranium (HALEU), enriched to less than 20% of fissile content (U235). The HALEU could be used in advanced reactors which are also small modular reactors (SMRs) that are not based on light water (LWR) technologies. (NucNet) The first experiment has been carried out at the US Department of Energy’s Idaho National Laboratory transient reactor test facility. INL said the resumption of experiments at the facility, known as Treat, is an important step towards restoring US nuclear energy transient testing capability. It said the experiment marked the return of a capability that is critical to the US’s role in the development of nuclear fuels, for both the existing fleet and a new generation of advanced reactors under design. Exposing fuels to extreme conditions in Treat helps the nuclear industry develop more resilient and longer lasting fuels. The experiment, carried out on 18 September 2018, is part of a series that will culminate in testing of new fuels being developed by the US Department of Energy for use in light-water reactors. The decision to restore transient testing at INL was part of efforts to revitalize US nuclear energy capacity,” said Ed McGinnis, principal deputy assistant secretary for nuclear energy at the DOE. (NucNet) Toshiba is in talks with asset management company Brookfield about taking its stake in the Moorside nuclear project in Cumbria, northwest England. The reports said the Japanese multinational is talking to Canadian-based Brookfield about a sale of its UK nuclear unit NuGen, which was set up to deliver the planned Moorside station. The talks have begun since Toshiba took away the status of South Korean utility Kepco as the preferred bidder status for NuGen in July due to the length of time that it was taking to agree a deal. Toshiba put NuGen up for sale as part of its wider restructuring in the wake of financial problems triggered by losses in its US nuclear business, Westinghouse, which was providing the three AP1000 units for Moorside. Brookfield bought Westinghouse earlier this year after Westinghouse filed for bankruptcy following delays and rising costs at the Vogtle and Summer AP1000 nuclear projects. (NucNet) The potential share of contracts that Romania’s nuclear industry could take in the construction and commissioning of the planed Cernavoda-3 and -4 nuclear projects is estimated to be between 25% and 40%, a study by the Romanian Nuclear Forum (Romatom) found. The study said local industry could receive between €1bn and €1.6bn of the value of engineering, purchasing, construction and commissioning contracts. The study estimated that local industry could provide about 19,000 jobs related to the completion of Unit 3 and 4 at Cernavoda. In November 2015, Nuclearelectrica and China General Nuclear Power Corporation signed a memorandum of understanding on the development, construction, operation and eventual decommissioning of Cernavoda-3 and -4, which will both be of the Canadian Candu-6 design. Negotiations have been continuing since then. Romania already has two Candu-6 units in commercial operation, Cernavoda-1 and Cernavoda-2. (NucNet) Malaysia is not making plans to develop a nuclear power program because of what it sees as the risks associated with it, the Asian country’s prime minister Mahathir Mohamad told a conference this week. Mr Mahatrir said previous governments were keen to pursue nuclear power because the cost of energy generated by it is lower than fossil fuel generation. But he said Malaysia still lacks the knowledge needed for nuclear power and the disposal of nuclear waste.